Rose, thank you for bringing us into your setting. I “hear” those ivories playing sweet music. Rose is happy to share her music with you, though she thinks a couple more weeks of practice will perhaps make the tunes tinkle more delightfully. she is hoping to enlist some of the girls to sing along in a Hitty Cupboard choir! Hope all of you have fun in the Ozarks. Thank you for the music Rose. You have a beautiful piano. We adore this piano, which we found in a thrift store! The Quimper Hittys sing very enthusiastically when Rose gets them going, though she wishes they would also keep time and sing in tune! Rose, your piano and chair are wonderful. Judging by the humming coming from our Hittys…I think they can hear your beautiful music. How wonderful to know that Rose’s music is lifting the hearts and voices of her friends all over! GOodness that is one fine piano! 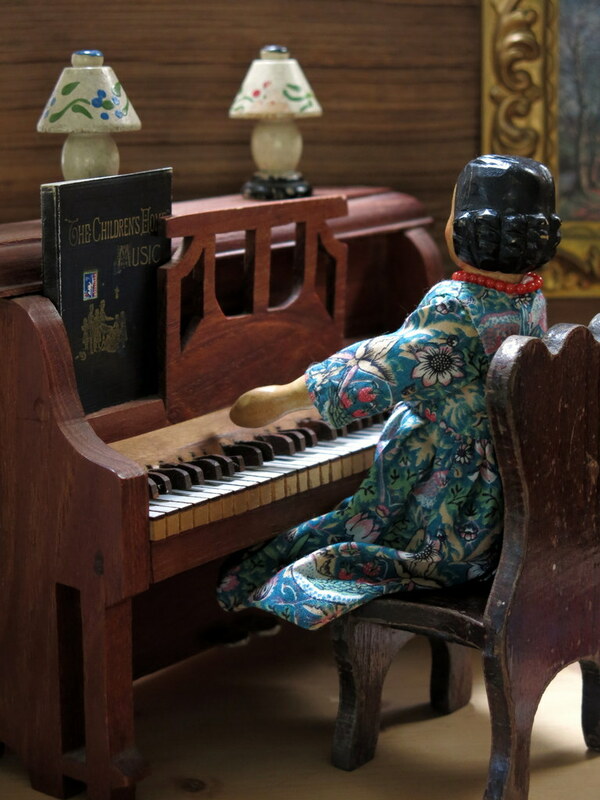 I am sure that Rose is an accomplished musician, The Country Hittys have acquired a piano but it is in need of some repair before any concerts can be performed. This has inspired us to start those repairs. Isn’t it fine? I think this is an upright piano family, and this one is a perfect size!